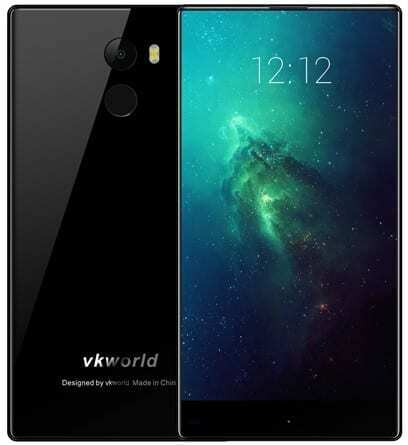 Vkworld Mix Plus is one the cheapest smartphones on the market that offers a “bezel-less” design. The device, which appears to take inspiration from Xiaomi’s Mi MIX, comes with a 5.5-inch display, 3GB RAM and Android Nougat. Featuring a metallic frame, the Vkworld Mix Plus boasts a rather svelte body at 7.9 millimetres in thickness. The weight of the device, also known as Mix+, is okay at 162 grams. It comes in black or grey finish. You are likely going to love the 5.5-inch IPS display, especially if you are operating on a tight budget. The display occupies 90 percent of the front of the Vkworld Mix Plus, leaving only the base where you have the Home control black. The curvy HD screen enjoys protection of Corning Gorilla Glass 4. You will find an 8MP camera on the rear of the Vkworld Mix Plus. This can be improved to 13 megapixels through software interpolation. It has autofocus, HDR, dual LED flash and Full HD video shooting capability. The 5MP selfie shooter can also be interpolated to 8 megapixels. Integrated storage looks relatively generous at 32 GB. You can as well expand this with a microSD card. There is a quad-core MediaTek MT6737 SoC on board. The 64-bit CPU clocked at 1.3 GHz receives support from respectable 3 GB of DDR3 RAM. With a Mali-T720 MP2 GPU on offer, the Vkworld Mix Plus should run many games and apps without glitches. Rich user experience may be expected with Android 7.0 Nougat being the operating system of choice. A 2,850mAh Li-Polymer battery appears like one to last many hours, especially considering the HD screen resolution. There is also a fingerprint sensor on the rear that not only allows you unlock very fast, but also to perform other functions, such as taking selfies. The Vkworld Mix Plus is said to be 4G LTE compatible. It has dual SIM slots, one of which doubles as a microSD card slot. Vkworld Mix Plus is not yet available in Nigeria, Ghana, and Kenya. The price starts at $109.99 at Gearbest. You can buy the smartphone at leading online stores in your country. Vkworld Mix Plus Price in Nigeria is expected to range from 41,900 Naira to 75,000 Naira.